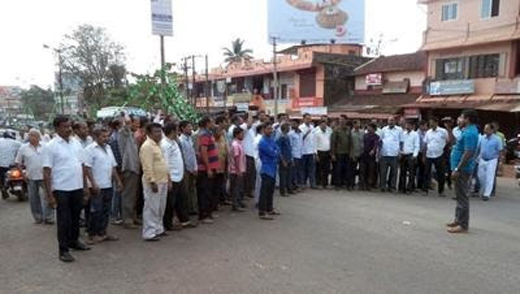 Manglauru, Nov 05, 2017: Speaking at a protest held at Gurupura-Kaikamba on Dec 4,Monday, National Highway 169 Action Committee organizing secretary Sudarshan Shetty Permanki said that a 40km road stretch between Mangaluru and Moodbidri has seen asphaltation only twice after it has been upgraded into a national highway in 2,000. He went on to add that the road, which was upgraded into NH 63 and later renamed as NH 169, is badly in need of development. "Around 21,000 vehicles ply on the road every day, but the condition of the stretch is very pathetic. The road is narrow and full of potholes. An old bridge at Gurupura is in a pathetic condition and not fit for heavy vehicles. Hence, the authorities concerned need to upgrade this NH into a four-lane road," Sudarshan demanded. He said a proposal in this regard has already been approved by the Union ministry of road transport and highways, but the alignment for the same has not been cleared by the district administration. "Politicians from the district are not interested in finding solution to the issue. While many vested interests want the alignment to be changed according to their needs, politicians are interested in gaining mileage out of the issue. Taking up patch works and filling potholes is not a permanent solution for such a prominent road stretch. We want it to be developed into four-lane as soon as possible. Similarly, a new bridge also needs to be constructed at Gurupura," he demanded.